These are cumulative curves, meaning that the things you can cast on the first turn also count on the second, third, and so forth. The Wolf Run and Strangleroot (R/G Aggro) curves drop off because the early acceleration cards don’t count in the mid-to-late game. What’s interesting, in light of Paulo’s thesis, is how Delver forms a smooth curve that comes up over the top of the other three archetypes. 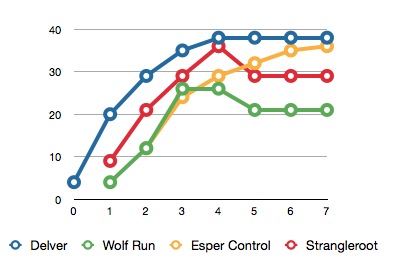 Esper Control has a similar curve, but is a consistent two turns late. As a final note on this quick conceptual knock-together, the Delver curve as shown assumes paying the Phyrexian costs for those cards where it applies. Obviously, it’ll push a little bit toward the start of the aggro curve if you instead pay full price. This entry was posted in Scars - M12 - Innistrad Standard, Standard by parakkum. Bookmark the permalink. First, you should label your graph axes. Come on, Alex, every good scientist knows this! Second, I’m a little confused about the methodology that leads to the cumulative curves being able to drop. Are you saying that you remove cards from the available card pool if they’re ramp cards? What’s the criterion here? T3: Everything from T2, plus Green Sun Zenith for 2 (2), Slagstorm (4), total of 17. Err, but what if on T2 there was a Sphere or a Rampant Growth cast? Then all the four drops *could* also be available: Solemn (3), Huntmaster (4). And do you stop counting ramp cards at this point, or not? Just a little confused about how you got the results you got. Hah! Yes, lazy on the axes. Sorry about that. So, this was a pretty notional tally. It may end up in the next In Dev, and I’m actually going to change some things and will explain the methods. You’re right that I’m dropping the ramp cards out as we get into the later turns. The Wolf Run deck also has its higher drops “bumped up” one CMC slot based on the presence of ramp. This isn’t modeling the chain of possible plays at all. Instead, it’s simply promoting cards at CMC 4 or above to one turn earlier in the Wolf Run deck. There’s a fairly big consideration *missing* from this rough charting, and I’m trying to figure out how I want to discuss that in a more in-depth article. Essentially, if you just look at this rough evaluation of the comparative curves, the other decks just come off as 100% nonsensical choices, instead of representing both advantages and risks. I would definitely love to see the methodology for how things are actually counted. It’s interesting because sites like SCG and TCGPlayer–and deck building software like Decked Builder–provide histograms of the mana cost, but they’re non-cumulative. Translating those into cumulative graphs is easy, but not if some cards don’t count or get moved for things like ramp effects. And then there are other complications like Phyrexian mana. The fact that things like counterspells and creatures with flash are usually used NOT on your own turn also makes the curve slightly misleading. This is actually a much more complex problem than it initially appears.